The RadMax spark-ignition engine is an internal-combustion engine based on the RadMax rotary design and fueled by gasoline, natural gas, ethanol or other fuel requiring spark to initiate combustion. Due to combustion chamber geometry and the required compression ratio of 7:1 to 10:1, it will typically utilize 9 to 10 vanes, creating 18 to 20 combustion events per engine revolution. With an idling speed of approximately 300 RPM, the engine is characterized by high torque, low vibration, reduced weight and low noise. 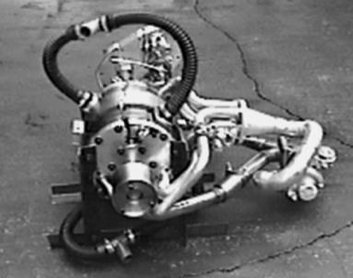 Several prototype RadMax gasoline engines of varying sizes have been built and tested. Like conventional piston-type, internal-combustion engines, the RadMax spark-ignition engine implements the Otto 4-stroke cycle. However, a RadMax rotary engine works in a completely different way. In a conventional piston engine, the same volume of space (cylinder volume) houses the four different strokes of the Otto cycle alternately: intake, compression, combustion and exhaust. A RadMax engine accomplishes these same four strokes, but each takes place in its own part of the housing. It’s like having a dedicated cylinder for each of the four jobs with the piston moving continuously from one stroke function to the next. In a RadMax spark-ignition engine, the pressure in each chamber changes as the adjacent axial vanes extend or retract. Driven by the rotor, the ends of the vanes follow along the surfaces of the cams which approximate a sinusoidal wave. This path is uniquely designed so that during each revolution of the rotor, the volumes of the chambers alternatively expand and contract. The process is repeated in each of the chambers on each side of the rotor. The RadMax rotor spins continuously in one direction, rather than violently changing directions as with the pistons in a reciprocating engine. Because the upper and lower faces of the rotor are 90-degrees out of phase, RadMax is always balanced and exhibits minimal vibration. For a specific chamber (see animation), outside air and fuel – if carbureted – (white to dark blue) is pulled into the chamber volume between two vanes through the intake port (INTAKE) and compressed (COMPRESSION) to a higher pressure and temperature (blue to yellow to red). Slightly past top dead-center, fuel is injected – if not carbureted – (INJECTION PORT) and a spark ignites the air and fuel mixture. The resulting high pressure and temperature of the combustion gases force the leading vane forward in the direction of rotor revolution. As the vanes continue forward, the combustion gases expand (POWER) to a lower temperature and pressure (red to dark gray), creating rotational torque. The expended gases are exhausted (dark gray to white) through the exhaust port and the cycle is repeated. It is possible in a RadMax spark-ignition engine to recover more energy from the expanding gases than from a piston engine by including an extended-expansion volume in the engine design. With a high-firing frequency based on multiple combustion events per rotation (determined by the number of vanes) and then doubled by the two cams (one on each side of the engine), the RadMax internal-combustion engine can generate more than 1 hp per pound of weight. This is approximately a 400% increase over a comparable-horsepower, gas-fueled piston engine’s power-to-weight ratio. Because of its high torque and horsepower-to-weight ratio, the RadMax spark-ignition engine is ideally suited as a prime mover for aviation, marine, automotive and truck, hybrid vehicle, and various power generation applications. In addition, its easy conversion to the use of natural gas could make a significant difference in meeting new clean air standards.